The recent Tampines DBSS project, Centrale 8, is a good example of the showing of people power in our economy, in particular the housing price. We all know that when the demand is greater than the supply, the price will go up. However, in the case of Centrale 8, it is the reverse. Even the demand is greater than the supply, the price goes down. The controversial expensive Design, Build, and Sell Scheme project at Tampines, Centrale 8, has been two times oversubscribed. 1,431 applications were received for the 708-unit project by the deadline on Tuesday. But Sim Lian Group, the developer, was forced to lower their indicative selling prices. The company can make more money in an extra of multi-million dollars but chooses to drop their prices by more than 10%. SIM Lian Group yesterday said that flats at its Centrale 8 public housing project in Tampines will sell for up to $778,000 - lower than the previous indicative top price of $880,000. Sim Lian said that the prices take into account resale prices of HDB flats in the same vicinity (taking into account the age and location); prevailing economic conditions; and the project's proximity to transport network, good public facilities and other amenities. Kuik Sing Beng, Executive Director at Sim Lian Group, said: "Five years ago, there was no announcement of the new Downtown Line interchange, as well as the new lifestyle hub. Comparatively, they can still afford a condominium in the suburban area, but this is very well-located, with all the new amenities. So I think the prices are reasonable." The prices are reasonable for both before and after the launch. There is no financial crisis, no property crash, and no external and unforeseen circumstances; even the pricing reason remains unchanged, so within a short period of one week, the indicative selling prices were forced to reduce. Why? If I were the shareholder of Sim Lian, I will ask why. The less income of extra multi-million dollars will result to lower dividend payout in the next AGM. The answer is most likely to be: People Power. After much public outrage, property developer Sim Lian Group last night announced that they are lowering the prices of its Design, Build and Sell Scheme (DBSS) flats at Centrale 8 in Tampines by up to $102,000. To be fair to the developer, the $880,000 is just an indicative price. "It is regrettable that during the application period, the media and members of the public did not take note of our repeated public emphasis that the price range which we had announced was only an indicative price range, and would not be the final sale prices for the respective types of flat units." If this is true, Sim Lian marketing and PR departments must be doing some things unusual and made the company looked stupid. Or, are there any reasons which the company cannot disclose? After all, the piece of land for Centrale 8, is in fact still a HDB land. Is the government helping you? No. If there are no buyers, there will be no sales. However, for Centrale 8, it has been two times oversubscribed. If this is a private and commercial decision, why should Sim Lian lower their prices? Perhaps, the company is doing a social good by providing a slightly ‘affordable housing’ in Singapore. Who give them the pressure? Who make them change their indicative pricing? If not the government, then it must be from the people. ‘We just can’t distance ourselves from the govt’. A Strong President for a Weak Government? It looks like we are going towards this direction. With Dr. Tony Tan applying for the COE for presidency and the high chance of wining the Presidential election, it seems to indicate that a strong and knowledgeable man will be the next Singapore President in September. Yes. He has the PM-material quality but turned down to be the PM. Goh Chok Tong was the second choice, and Ong Teng Cheong – the first elected President ranked even further. Even the current President, S R Nathan, has said that Dr Tan has the qualities to lead the country. Even those voters who want to vote against Dr. Tan will agree that he is the best qualified person in terms of talent, management and knowledge. But does a strong candidate necessary mean a good candidate for President? Since the GE in May, the PAP government wants to project an image of a listener. It appears that the government wants to do away with the past high handled way of governing Singapore. They want to collect feedbacks and implement policies for the benefits of Singapore citizens. The government in this way is engaging ‘yin’ role and a high profile candidate like Dr. Tony Tan, perhaps also for the other 2 potential candidates, all need to play a different role than the present President and have to take on the ‘yang’ role. President Nathan had said few knew his contribution and his type of low key performance seems to suggest he is playing the role of ‘yin’. So, with the GE2011 and the coming Presidential election, we will see the role change of the government and the presidency. They are exchanging role from the past. This is good. The President (yang) champions for a unified force, a united Singapore and prevent social divide. And the government (yin) accepts the criticisms and suggestions from the people. In Yi Jing principle, this is good for the country as the ruler is humble and cares for the people. Difficult time, complex changes. Is there anything that we do not know? In announcing his candidate for the President, Dr Tan seems to suggest the country is facing difficult time, complex changes, and needs to undertake tough decisions to reform institutions in coming years. That is why he believes the country needs "a president with experience and a steady hand" (likes him). This is like the Chinese saying of ‘国难当头 匹夫有责’. When the country is facing great difficulty, a person must show his duty and responsibility to come forward. Our GDP growth is good; the property market is stable; the stock market has not crashed; the tourist arrival reaches new high and the job creation also looks good. But Dr. Tan foresees the challenges and danger. Is there anything that we do not know? Can Dr. Tan enlightens us and gives some advices? 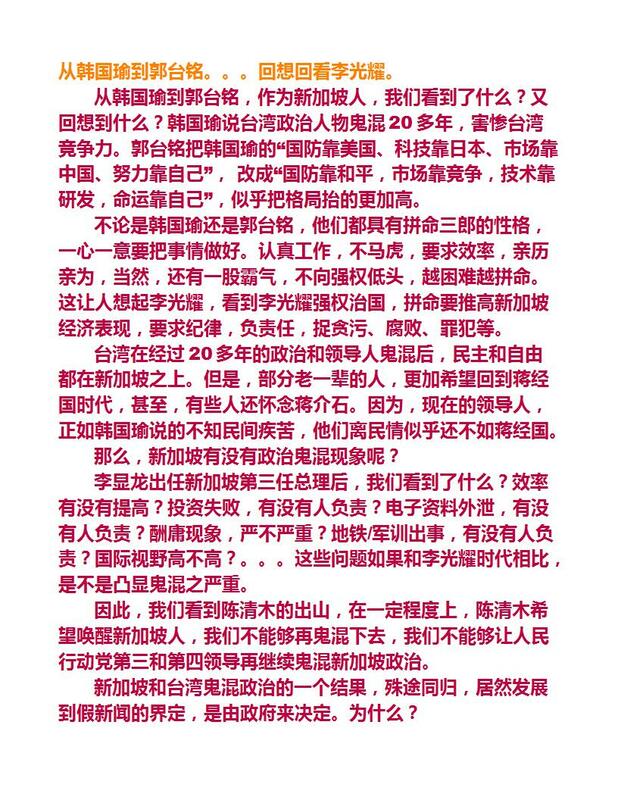 Zaobao reporter asked twice about this issue. I don’t why. Dr. Tan replied that any changes will need to be debated in the Parliament as representatives of the voters and the Parliament has to consider what other power or suitable changes to be given to the President. Or, in Yi Jing language, what ‘yang’ role the Parliament and the government want the elected President to play? However, at least, there is a hint that there may be some constitutional changes to the role of President. Will it be more ‘yang’ role for the elected President due to a weak government that the new batch of ministers is less qualify than Dr. Tan’ era when he was a DPM. Stable President = Strong President? Dr Tan said he could not remain a spectator while Singapore faces ‘complex changes’. ‘临危受命’ is another Chinese proverb that can describe the decision of Dr. Tan. It seems there are difficulties ahead, and the government needs guidance and advices from a ‘wise’ man. Dr. Tan with his experience has to take on a higher role to provide direction for the government. But due to the non-executive power of the President, Dr. Tan may not be able ‘to advise on some policies’ or to guide the government into the right direction. Hence, there may be a need to have some changes in the Constitution. Dr. Tan has always projected a serious, stable, knowledgeable and intelligent man. Therefore, he is more ‘yang’ than George Yeo whose image is ‘yin’. (See my previous posts on George). And the role of next President is more suitable for a ‘yang’ candidate. Independent candidate – is there a need to stress it? If you have resigned from the PAP, and being a non-party related candidate, surely you are thinking differently from the previously associated party and even the government. Is there a need to ‘画蛇添足’ drawing a snake with unnecessary legs? The other 2 potential candidates seem to be more independent and why they don’t stress it? The more you talk about it, the more people will think about it. After so many years, we finally get to see a Presidential election, no walkover. I think this is a positive sign for a better Singapore. 2011 Up and Coming is basically a Chinese blog created for the sole purpose of providing alternative views. However, it also posts some English articles, especially after GE2011. When misfortune reaches the limit, good fortune is at hand. Out of the depth of misfortune comes bliss. ‘2011 Up and Coming’ in some ways reflects and provides a meaning that the Oppositions after more than 50 years of misfortune, 2011 is their turning point and good fortune will arrive. GE2011 shows some indications but the impact is too small to have a 2-party or multi-party parliament in Singapore. This is why after one month of the birth of ‘2011 Up and Coming’, a decision is made to create another blog ‘Piji Tailai’ to show the continuation of the up and coming spirit beyond 2011. The real Piji Tailai will only come 1 or 2 or perhaps even more general elections. Where there is a will, there is a way. Piji Tailai will like to continue this yet to complete journey for the alternative views. This will be the last posting in 2011 Up and Coming and Piji Tailai will continue the baton with a more balance posting in both Chinese and English. Will PM Lee do a ‘Chiang Ching-kuo’ in Singapore? After May 7 election, PM Lee made some changes that seem to be big changes in Singapore. Some observers even said he had re-discovered himself and been fully in charge of the government by his own judgment (less the influence of Lee Kuan Yew). It is too early to tell whether PM Lee’s commitment to change and listen to the people will go deeper and become a permanent change in Singapore politics. However, comparing to Chiang Ching-kuo of Taiwan in the 1980s, PM Lee is still far behind. Firstly, Chiang initiated political change without the pressure from voters. Secondly, the changes that Chiang made have far greater impact and meaning than the changes announced recently by PM Lee. * Improving the public transport system. If you compare these changes to Chiang Ching-kuo, may I use the famous quote? It is just a peanut. Let see what Chiang Ching-kuo did in Taiwan then we can have a better understand of the meaning of change. He created a democratic system in which the people could choose their ruler. He lifted martial law and the ban on political parties and non-official media. These changes or contribution to Taiwan democracy are both recognized by the Kuomintang and the Democratic Progressive Party. This is something strange in Taiwan politics that these 2 parties rarely agree on one common agenda. PM Lee never touches on the ISA, the media, a fairer political competition and system, even the role of elected President is confusing as many people are not clear about its function after more than 20 years. The law minister and a former senior minister need to come out to clarify the appointment and function of the Elected President. PM Lee recently announced changes may result to future acknowledgement of the PAP and the oppositions but it is really a bit too far from any impacting or influencing change in Singapore politics. Hu said: Taiwan’s successful transition from authoritarian regime to democracy suggests that neither a Leninist party structure nor a Confucian cultural heritage is a bar to democratization. Taiwan’s experience also clearly illustrates that democracy can be achieved through political leadership, a mode of democratic transition that has been emphasized in recent scholarship by Samuel Huntington, Bruce Dickson, and Steven Hood, the lattermost of whom argues that democratic transitions are brought about by political elites who have changed their attitudes about democracy. In the paper, Hu also stressed the importance of political learning that I am not sure whether it is equal to the PAP’s stress of listening to the people. We will have to wait and see the changes in attitude of Singapore political elites and their political leaning about democracy from GE2011 and the coming Presidential election. George Yeo for President – A Dream or a Stone?